Flagship Merchant Services offers real-time payment processing solutions for small businesses. Its features include POS, shopping cart setup, reporting, sales tracking, and more. In this article, we cover user reviews. Ready to get started with Flagship Merchant Services? Visit their website. As of the date this article was written (12/03/18), there are no recent positive user reviews of Flagship Merchant Services online. If you are a past or current Flagship Merchant Services customer, leave a review to help other business owners who are deciding whether or not to use the software. Users who gave Flagship Merchant Services a negative review complained about the company’s poor customer support. Some of them also experienced issues involving hidden charges and withheld funds. A user who left a negative review of Flagship Merchant Services on Consumer Affairs said that he was charged more than $122 even without any transaction. He added that the company did not refund the charges so he ended up canceling the service subscription. Flagship Merchant Services doesn’t publish their pricing plans online. According to a third-party website, there’s a $7.95 monthly fee, another $7.95 monthly gateway fee for accepting payments online, a $99/year PCI compliance fee, and a minimum of $25 in processing costs per month. Ready to get started with Flagship Merchant Services? Visit their website. How long does it take before transactions are funded and reflected in the merchant’s account? Funds are usually transferred to the merchant’s account within two days after the transactions are completed. Does Flagship Merchant Services allow payment processing outside the office or store? Yes. Flagship Merchant Services has a virtual terminal that store owners or merchants can access using the free mobile app. Through this feature, they can accept and process payments even when on-the-go. 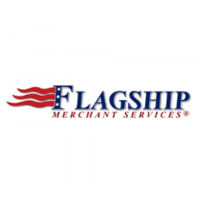 Not sure if Flagship Merchant Services is the right fit for you? Read our reviews of top merchant services providers or check out one of these three Flagship Merchant Services alternatives.